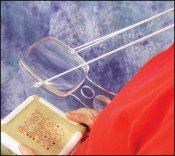 Hands Free Magnifier, Neck Magnifier  - $11.00 : Yarn Tree, Your wholesale source for cross stitch supplies. Item 7302. Neck Magnifier. Great for all types of needlework. Large 4” lens magnifies 2½” times; plus a small close-up lens in the base for detail work. Has an adjustable nylon cord to hang magnifier around your neck. Easy to use and works very well. The acrylic lens is lightweight and comfortable to use. Because these are acrylic, some small scratches and flaws are not unusual. These do not detract from the quality of the magnification or view through the lens.